Progressives deride these awful, frequently dangerous, and racist behaviors, and they then rightly call on conservative leadership to distance itself from these activities. Let me suggest though that if we wait for conservative leaders to show concern about the threat to civility and public safety in this new wave of “activism,” then progressives might as well surrender on climate change, health care reform, immigration, and just about everything else we stand for. For many progressives, this same type of angry, scary conservative activism was first on full display less than a year ago at the presidential rallies of Sen. John McCain (D-AZ) and Gov. Sarah Palin of Alaska, when activists at their rallies shouted "terrorist," and "kill him" about Barack Obama. But for those of us who work on immigration reform, we had seen this type of extreme right political theater well before then. The strategies used by the "tea-party" clique, screamers in town halls, as well as conservative talk radio and television personalities were perfected in fighting progressive immigration reform. So here are some lessons that we have learned that hopefully will help our progressive allies in the health care reform, climate change, and energy debates as they go up against protesters organized and directed by a clutch of extreme right-wing groups in Washington, D.C. While it is important strategically that anti-immigrant and now anti-health care forces appear to be simple manifestations of spontaneous disgust with progressive legislation, that is simply not the case. There are a small number of Washington-based organizations that provide strategy, funding, and talking points to "grassroots" groups. In the case of the anti-immigrant cause, FAIR, NumbersUSA, and the Center for Immigration Studies, provide legal support and regional organizers to foster local groups, give them talking points and organizing strategies, as well as furnish them with easy-to-use online tools to get in touch with their members of Congress. In the anti-health reform arena, well-funded groups such as Americans for Prosperity, Conservatives for Patients Rights, and FreedomWorks play the same role. Other groups, among them Grassfire.org, are happy to switch between immigration, health care, and climate change to mobilize mostly manufactured conservative rage wherever they can find it. The lesson: All strategies involving pushing back against these astro-turf forces should include addressing the national organizations, not just their local tentacles. Research how they are funded, what their ultimate goals are and what means they use to engage local activists. Then build the capacity to address them accordingly. At the same time, it is important to ensure that local media treat the local manifestations of these groups as what they are; part of a conservative national strategy. These abusive hecklers are not local, suddenly angry people who otherwise might vote for a progressive. On the immigration front, we learned that these organizations built large lists of issue-specific activists, boast sizable online organizing capacity, and direct specific field operations. With this information in hand, we are able to specifically organize responses to what they do and understand they are our primary nemesis, not some amorphous and spontaneous "will of the people." The leading anti-immigrant organization NumbersUSA often speaks about how it opposes racism. Yet if you go to the neo-Nazi website Vinlanders.com, right near the top of the page is a button linking you to NumbersUSA. And NumbersUSA consistently buys ads with known hate groups denouncing immigration reform. You will find the same thing around those highly organized tea parties. Posters on the white nationalist Stormfront.org website regularly encourage others to come out to tea party activities. Indeed, the Anti-Defamation League reports that at some "tea parties," white nationalists described being well received by conservative activists when passing out hateful literature while elsewhere they were not. The heavy involvement of social misfits, racists, and thugs does not happen by coincidence. It is instead an organizing strategy. The Washington-based conservative organizations’ goal? To get people who are willing to come out for the cause no matter how destructive their behaviors or wrong their worldview. Whatever the foot soldiers believe and however they behave is okay as long as they are willing to show up in numbers and yell out carefully scripted talking points. That’s why NumbersUSA chief executive Roy Beck and the leaders of other large Washington-based anti-immigration groups have spoken at meetings of the Council of Conservative Citizens, a virulently racist organization that calls black people a lower species of life. Similarly, conservative leaders are continually unwilling to denounce the behavior of the bizarre Orly Taitz, who is behind much of the patently racist "birther" movement. Denunciation would carry with it the loss of placard carrying, TV-ready angry citizens, much in demand by conservative leadership. The lesson: Do not let these connections go unnoticed. Call conservative groups on their willingness to engage with racists. Do so publicly and with the press. Make it much harder for mainstream conservatives and elected officials to rely on racist organizations to move their messages or provide foot soldiers for their campaigns. This is not the same as saying that everyone who opposes President Obama is a racist or that everyone who is concerned about securing our border is a bigot. Lots of decent people disagree fundamentally with many of the president’s policy positions, including on immigration, energy, and health care reform. But groups with clear antipathy toward other people because of their race should not be the army on which any legitimate group moves its political agenda. Progressives will get pushback when they take these steps. Conservatives will say it’s not fair to call someone a racist. They will also argue about the need for all ideas to be discussed openly, no matter how ugly. But the immigration fight has shown that unless we tackle these connections to racist groups directly, repeatedly, and with clear defensible facts, then these bigots will continue, and increasingly offensive ideas will get treated as acceptable points of debate in the mainstream media. Equally important, mainstream conservatives will be able to use despicable people to disrupt public discourse while disavowing any knowledge of their actions or ugly beliefs. In the immigration fight, there are several basic issues that conservative and progressive supporters of comprehensive immigration reform can debate. For instance, how many people should be let into the country every year to engage in farm work and what labor organizing rights they should have are not universally agreed upon by people who want to pass a reform bill. So, in the normal course of legislation, a compromise would be reached that would not fully satisfy either side, but would suffice to get enough votes for passage. But for true anti-immigrant groups, the only acceptable answer to how many new immigrants should be allowed in next year is zero. So their goal is to ensure that there is no chance for a compromise, no chance that conservatives and progressives sit down and find a number that is tolerable to both. Any such number would be millions more people than zero. "Pack the hall…spread out" to make their numbers seem more significant, and to "rock-the-boat early in the Rep’s presentation…To yell out and challenge the Rep’s statements early…. To rattle him, get him off his prepared script and agenda…Stand up and shout and sit right back down." Their only objective is to disrupt members of the House and Senate so that he or she cannot get into an honest dialogue with people who just came to the town hall to actually learn something. Honest dialogue is their enemy because facts are not in their favor. The lesson: You have to know these tactics are going to happen and prepare for them. This means that every public event with an elected ally or potential ally requires a strong presence from supporters of health care reform or immigration or whatever progressive issue is under attack this week. Immigration advocates set up email lists to alert supporters whenever their voice is needed in a public meeting or even just to add their words to the comments following a news story online. Increasingly, progressive local blogs have started playing this role in the health care debate. 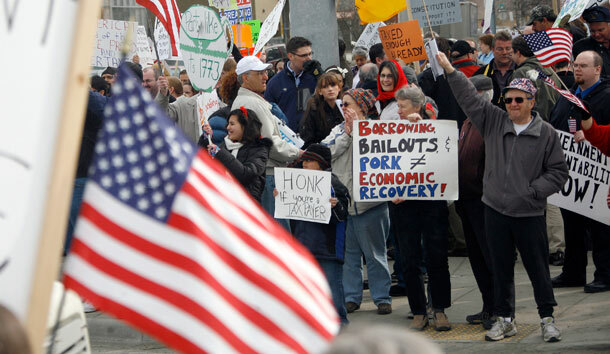 The result: progressives have sometimes outnumbered "tea baggers" in some recent town halls. Whether it’s a member of Congress’ town hall on health care, or a city council meeting discussing the need for progressive local immigration policies, progressives should from this point forward expect that a disorderly fringe has been fully embraced by conservative organizations and leadership. It is important to put systems in place to organize to get people out to these meetings, explain to the press who the opposition really is and how they got there, and be sure that the people organizing the event are aware of the possibility of disruption and have set ground rules to minimize it. Long before Lou Dobbs began sharing the lie that Obama was not born in Hawaii, he had other whoppers that did not stand up to even the slightest fact checking. This includes his trumpeting the conspiracy theory popular among skinhead and Minuteman types that Mexican-American U.S. citizens who have lived in this country for generations are engaged in a plot to return the southwest to Mexico. As bizarre as that one is, Dobbs is probably best known for another outright fabrication. Dobbs used the lies of Madeleine Cosman to report that Latino immigrants were responsible for 7,000 new cases of leprosy in the United States a year. The recently deceased Kosman was a serial liar and anti-immigrant propagandist who had no expertise in leprosy or public health for that matter. The New York Times looked into Dobb’s reporting and found that the federal registry for Hansen’s disease (leprosy) had only 7,000 cases of leprosy in the last 30 years in our country. Dobbs refused to acknowledge this error, leading The New York Times to report that "Mr. Dobbs has a somewhat flexible relationship with reality." Just like with the "birther" controversy, CNN leadership fell back on Dobbs right to say what he wants on the "most trusted name in news." The network and its owners took no action to stop Dobbs from sharing repeated conspiratorial lies with his viewers. The lesson: The Southern Poverty Law Center’s letter to CNN to remove Dobbs and MoveOn’s petition condemning Dobbs’ promotion of "outlandish conspiracy theories" are right on target. Progressives should join this cause, exposing Dobbs to ridicule and consistently shaming CNN for its willingness to associate the CNN brand with racist conspiracy theories. Otherwise, Dobbs will continue to spread lies to undermine progressive goals in virtually every area from climate change to health care to immigration. And CNN will continue to look the other way. Glenn Beck rants every night on Fox News about traitors, patriots, and the need to retake the United States. He calls Obama a "racist" with a "deep-seated hatred for white people" and says the president wants to take away your guns; all while encouraging his viewers to be the "defender of liberty." The racist Pittsburgh cop killer Richard Poplawski and the alleged Holocaust Museum security guard murderer James W. von Brunn, both parroted in their writings their distaste for the new black president and their unfounded belief in his desire to take away their guns. When the connection to Beck’s rhetoric is drawn, Beck claims he has no responsibility. Actually he compares himself to a "flight attendant," just warning Americans about the coming "worst case scenario." Where have we seen this all before? How about when long-time Minuteman personality Shawna Forde conducted a home invasion that led to the murder of the 9-year-old Mexican-American girl Brisenia Flores and her father two months ago. Suddenly, the national anti-immigrant movement and the full range of Minuteman groups got simultaneous amnesia discounting both her role in their efforts and their personal relationships. The conservative tactics at the health care town halls have now crossed the line to include violent behavior. At a town hall meeting in Tampa Bay, Rep. Kathy Castor (D-FL) faced conservative protestors banging on windows, trying to force their way into an already-filled hall, and engaging in a fistfight inside the meeting. This is not surprising. The combination of language used by Beck, Rush Limbaugh, and other conservative leaders, along with the very nature of who some of the activists are, almost guarantees that violence will eventually occur. Indeed, many of the Tampa Bay conservative activists said they came because of notices posted on the website of Tampa912.org, an offshoot of Beck’s 912 Project. Expect that if and when this violence escalates, Minuteman amnesia will strike conservative leadership. The lesson: The potential for violence is now a very real component of conservative organizing. For most conservatives, violence is as equally reprehensible as it is for most progressives. But the mixture of combustible rhetoric espoused by recognized conservatives on radio and television with the willingness of Washington-based conservative groups to incorporate truly reprehensible thugs in their local organizing due to the need for activist foot soldiers ensures that a line will be crossed, and crossed repeatedly. There is no easy solution to confronting violence in our democracy. Many civil rights organizations working on immigration have implemented security plans to protect their employees. Similarly, members of Congress and progressive organizations will have to evaluate whether they can maintain safety at their public events. Issues of security including where people can sit, how many people can fill a hall, and determining whether the police attend certain gatherings are all part of planning for immigration meetings in the modern era. Unfortunately this kind of planning must now also go into talking to constituents about whether their government will help them get affordable health care. Henry Fernandez is a Senior Fellow at the Center for American Progress. To read more of his columns and the Center’s policy positions and recommendations on immigration and health care please go to the Domestic page of our website.